When you were a kid, your parents may have told you to eat carrots so you wouldn't need glasses. While that may not have panned out, carrots do in fact contain a wealth of beta-carotene, which your body processes as vitamin A. They're also an excellent source of biotin, potassium, and vitamin K, so these bright, sweet vegetables are as healthy as they are delicious. Meet your carrot quota with these delightful dishes, from appetizers to desserts. Roasting carrots brings out their earthy sweetness, and adding red onions increases the effect. Use good-quality olive oil and a little flaky sea salt, and you won't need any additional seasoning. Multi-colored heirloom carrots look especially beautiful in this simple, classic recipe. Break out your slow cooker for these sweet glazed carrots that basically turn these humble root veggies into candy. A mixture of orange, cinnamon, and brown sugar give carrots a delightful caramel-like coating that goes beautifully alongside a holiday ham or roast, as well as with a weeknight dinner. Multiply the recipe for a larger gathering, as it scales up well. You may not think of tossing these vegetables on the grill, but carrots take on a complex, smoky flavor when roasted over hot coals or even on your gas grill. Just give them a quick peel, trim off any leafy greens so they don't burn, and brush your carrots with oil and a sprinkling of whichever chopped fresh herbs you prefer. They're the perfect side for any grilled proteins, or a vegetarian option for non-meat eaters. It takes a couple of weeks for these spice-scented pickled carrots to mature, but they're well-worth the wait. The recipe calls for nigella, a flowering plant native to Southwest Asia which has a flavor that's similar to a combination of oregano, black pepper, and onion. Order it online if you can't find it at your local grocery or spice store. Think spring with this simple, citrusy side dish. Dress crispy carrots and tender asparagus with a simple lemon sauce that cooks up in one skillet in about half an hour. It makes a beautiful side dish for lamb, ham, or any other spring protein. Lemony carrots and asparagus is also perfect for a holiday gathering or an elegant Sunday supper. When you're short on time, this is the carrot side dish for you. With just baby carrots, butter, salt, and pepper, you've got an easy and delicious veggie that the whole family will love. Memorize this simple recipe, and you'll never have to wonder what to serve with supper again! A classic Moroccan tagine is cooked low and slow to allow the dish's complex spices to permeate the meat and vegetables. The result is a rich, aromatic flavor that's definitely worth the wait. Don't be intimidated by the long ingredient list; the blend of spices will fill your home with a lovely scent that will have you salivating. Serve with a side of bread or rice to sop up the savory sauce. This carrot bisque's rich, deep flavor comes from roasting the carrots first. The extra step creates a complex taste without any dairy and minimal additional spices. Use any variety of carrots you like best; heirloom varieties would be a fun addition. Coconut cream gives the soup a luscious, spoon-coating texture. These moist, slightly sweet carrot and zucchini muffins are chock full of healthy veggies and taste great with butter or cream cheese for breakfast or a light tea snack. The cinnamon sugar streusel imparts a "special occasion" flavor any time. Fans of carrot cake will love this nutritious spin. This zippy carrot and kohlrabi slaw is perfect alongside barbecue or atop grilled burgers. The addition of healthy kohlrabi gives the slaw a peppery crunch. If you've never tried this odd-looking but delicious vegetable, this is an excellent introduction. If yours has leaves, feel free to slice them into ribbons and add them in as well, similar to how you would add Swiss chard or Kale. These tasty drop cookies are as nutritious as they are delicious, with fresh orange icing and grated carrots providing ample vitamins. They're a snap to make, and taste just like spring at any time of year. Add fresh orange juice to the icing for best results. If you're leery of mixing carrots and oranges together, let this classic Moroccan salad change your mind. Chopped navel oranges, grated carrots, and lemon juice all blend together for an aromatic, sweet and tart salad that's a great start to a special meal. It's also a great light and bright dessert. The oranges will release their own juices as they macerate, but feel free to add additional orange juice for more flavor. Whether you follow a vegan diet or simply want to mix things up at dinnertime, these carrot hot dogs are a nice change of pace. No fancy ingredients required; just marinate the carrots in a soy and maple glaze, then top with additional roasted veggies for a smoky, nutritious kick. Roast them in the oven or toss on the grill — the choice is yours! Try this classic side dish, made with grated carrots and raisins, coated in creamy mayonnaise and spritzed with lemon juice for extra zing. During the holidays, dried cranberries make a perfect seasonal substitute for the raisins. Add pineapple chunks for extra sweetness, and use multi-colored carrots if you can find them for a beautiful presentation. This Indian-scented soup is gluten-free and vegan, making it suitable for those with dietary restrictions, but it's as rich and luscious as any cream-based soup. Fresh minced ginger provides a more assertive flavor than its ground counterpart, and is worth the extra work. Serve with crusty bread for dipping as a light supper or a nice warming lunch. Is there any better springtime dessert than a classic carrot cake? This moist, walnut-studded cake gets its luscious texture from grated carrots. Chopped pineapple adds an island-inspired sweetness. Top the cake with cream cheese frosting sprinkled with more chopped walnuts or pecans. Feel free to add raisins, as many traditional recipes call for. Your guests will be wowed by a high, light, fluffy carrot soufflé that truly showcases this sweet and earthy vegetable. A non-traditional soufflé, this one doesn't require you to separate the eggs, and gets its height from baking powder instead. Serve it alongside a roast or other protein for an impressive, delicious dinner. If you've got a well-stocked pantry, you may be able to make this vegetarian meal without even hitting the grocery store. Loaded with lentils, potatoes, carrots, scallions, and garlic — plus plenty of curry and chili powder — this dish is as hearty as it is fragrant and spicy. It reheats well too, so make a little extra for lunch the next day, or freeze it for another time. Feeding a crowd? Look no further than this decadent carrot sheet cake for dessert. Baby carrots are the secret to its extra-sweet flavor and tender texture, even though they're a bit more labor-intensive to shred. Cream cheese frosting adds a smooth texture and slightly sour tang that really complements the cake. Serve it with a cup of coffee or tea for a delicious afternoon treat. Celebrate the best of spring vegetables with these quick-braised carrots and sugar snap peas. This method brings out the sweetness in each, while preserving the tender snap of al dente vegetables. A little fresh parsley finishes this simple dish beautifully. 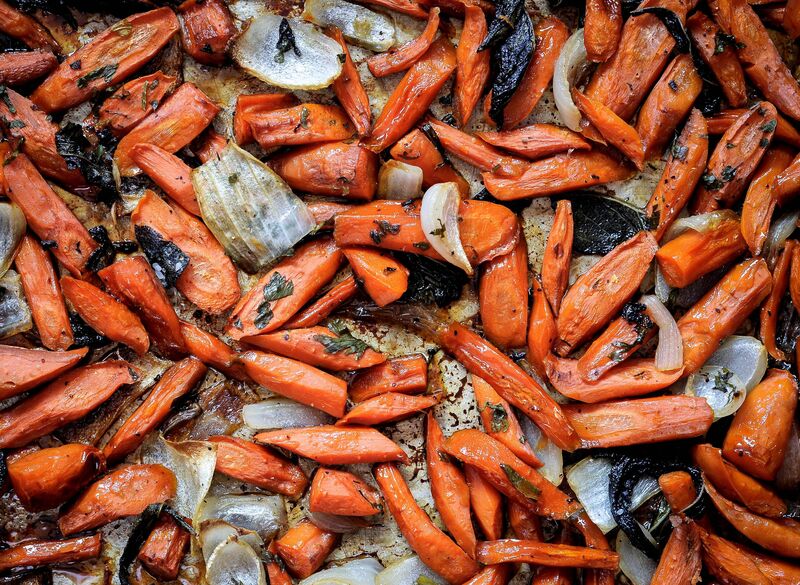 Use small, young carrots since you're braising them whole, or cut larger ones in half or quarters for an ideal texture. Enjoy the flavors of Chinese takeout without all the added fat and sodium, by making these sweet and sour carrots. Pineapple chunks, bell peppers, and a delightfully clingy vinegar and soy-based sauce comes together in under half an hour: a quick and easy dish if there ever was one. Serve it over white or brown rice, to soak up the tasty sauce. Plov is a slow-cooked dish with chicken, carrots, and rice traditionally served to welcome guests at Central Asian weddings and other celebrations. It includes cumin, which you can add to the sautéed chicken and vegetables if you'd like to want to punch up the flavor. This dish is a warming, hearty meal in itself that will soon become a staple of your culinary repertoire. Amaretto Almond Carrots Recipe. © 2013 Peggy Trowbridge Filippone, licensed to About.com, Inc.
For a holiday-worthy twist on the usual honey-glazed carrots, try adding amaretto to the mix. The almond liqueur gives them a nutty, slightly floral flavor that complements the vegetable perfectly. If you'd rather not use alcohol when cooking, almond extract will also work well. Serve with blanched almonds for a little crunch. Enjoy carrot cake's moist, decadent sweetness without the fuss, and bake a batch of these easy, delicious carrot cake cookies. They're packed with healthy veggies, plus oats and walnuts for crunch and texture. The signature warming spices you love in your favorite slice are there too, so preheat the oven and get mixing! 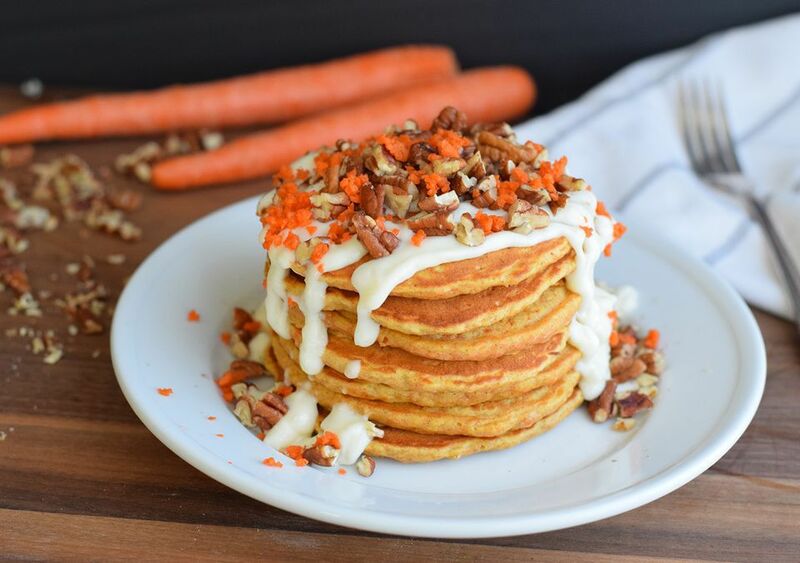 Have your cake for breakfast with these Easter morning-worthy carrot cake pancakes! Start the day off right by pulsing the carrots in your food processor instead of labor-intensive grating, and you're just a few ingredients away from an easy and festive stack of flapjacks. Cream cheese drizzle is, well, the icing on the cake!